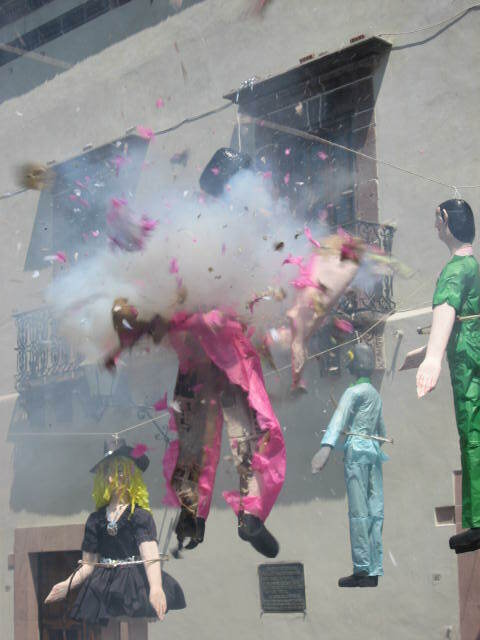 For some odd reason, this is one of my favorite celebrations in Mexico…the public annihilation of effigies as an expression of political statements and/or for pure comic relief. You never know how long one will burn…when it will actually blow up…or if one might just sizzle and die. 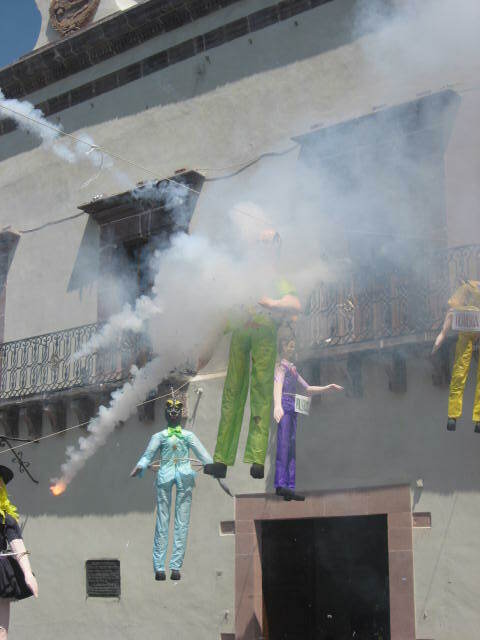 You just know that there is a thrill and a release after all the seriousness and mourning during Holy Week in San Miguel de Allende…and it is truly a blast! ~ by Dawn Elliott on May 3, 2012. Far out! Looks like a blast! 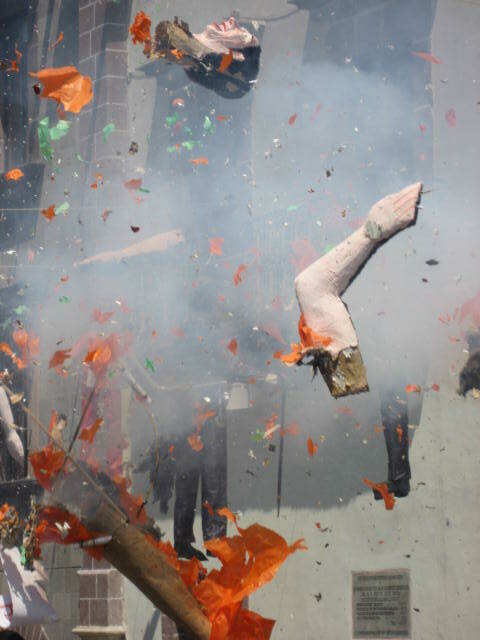 as much crazy fun as the blowing up event is i am still on the hunt to find the neighborhood where these effigies are created. such a centuries old process that has changed little over the years, except of course for the “characters” they have blown up over the years. now that would be an interesting “hall of fame”. love your explosive haiku today! 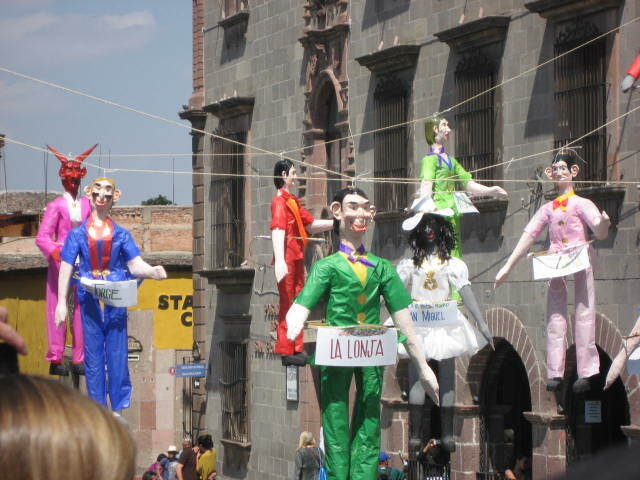 Wow…sort of creepy, especially the head flying off!! This is so cool! I didn’t know about this. :). You got good shots; especially that arm blowing off. Lol! Thanks for sharing your experience in pictures and haiku, This was fun to read and learn about. yes i agree, these are so fun, weird.. in Greece at Easter years past we did the same – love the photo too! Sounds great and irreverent and fun! I didn’t know of this ceremony, and I love the photos. Gorgeous! I can imagine the relief of the people, like a closure of something.